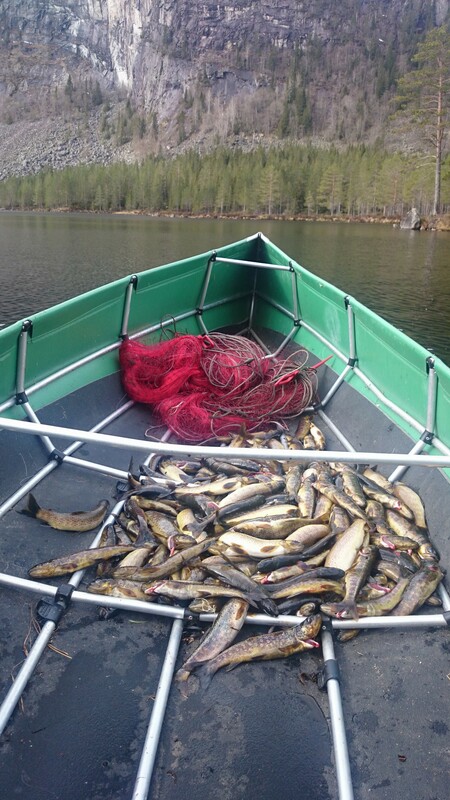 The ice is gone from the lakes and we’re in the best time for catching trout with nets. 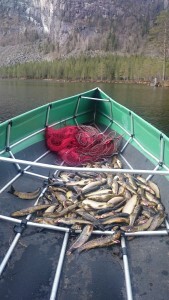 Set two nets yesterday and caught 161 trout. 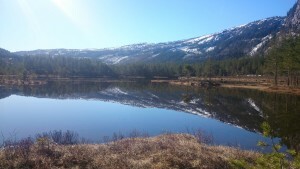 The good fishing will probably go on until late may, after which it’ll get poorer and poorer. More details around net fishing and other techniques can be found in my book about traditional trout fishing. The water in spring tastes pretty bad. It takes with it a lot of nutrients that have been released by dying vegetation over the winter. 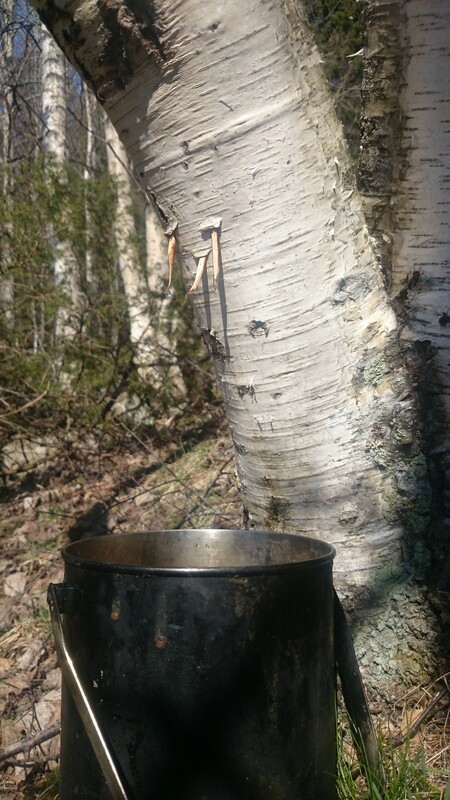 Although I still drink water I prefer to drink birch Sap at this time. It’s easy to get in bucketloads and it is highly nutritious. 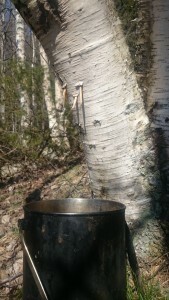 Settlers in northern Sweden a few centuries back used it instead of water for all drinking and cooking while it’s was available. The birch was sometimes even called “the poor man’s cow”. I’m using the the method shown in the video a few posts back. I have found it important to keep a steep angle on the sticks guiding the droplets. If not they will simply run down the trunk. The Sap only flows during the day, so start tapping in the morning and get your drink in the evening. Enjoy! Every spring I make an effort to increase my experience in land management by burning. Unfortunately I need to be a bit more careful than I would prefer because of regulations and fearful neighbours. This year we have had an exceptionally long lasting spring, with snow lingering on for quite some time after the bare patches have dried up enough for burning. 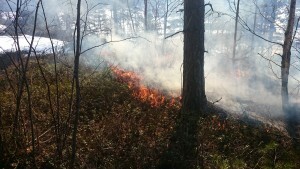 Burning in between snow patches is always safe, since the wet and cold of the snow will stop even a raging forest fire. First I isolate the burning area by identifying bottlenecks which the fire can spread out of the area I want to burn. 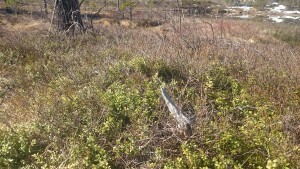 These are usually continuous areas of dry grass or heather. 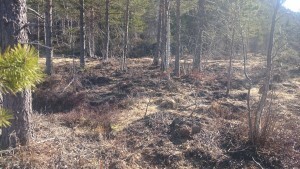 Bogs, lakes, moist forest floors and snow patches form the perimeter of the burning site. Ditches and streams can function as a perimeter, but beware that a raging fire can jump narrow streams easily. Start a fire right next to it to burn away as much as possible before you start the main burning. When I have identified the potential places where the fire can spread, I use several strategies to contain it. Snow or water can be generously sprinkled to make a barrier. Snow is better, since it doesn’t dry up as fast as water. If the bottleneck is very narrow I sometimes just start the burn there and keep it from spreading in the wrong direction by beating the fire with soaked spruce branches. It’s critical to start burning from the bottlenecks towards the wind direction. Then you remove fuel from the more intense fire that will come later. When the fuel has been consumed in the downwind bottlenecks you start burning in the bottlenecks upwind. 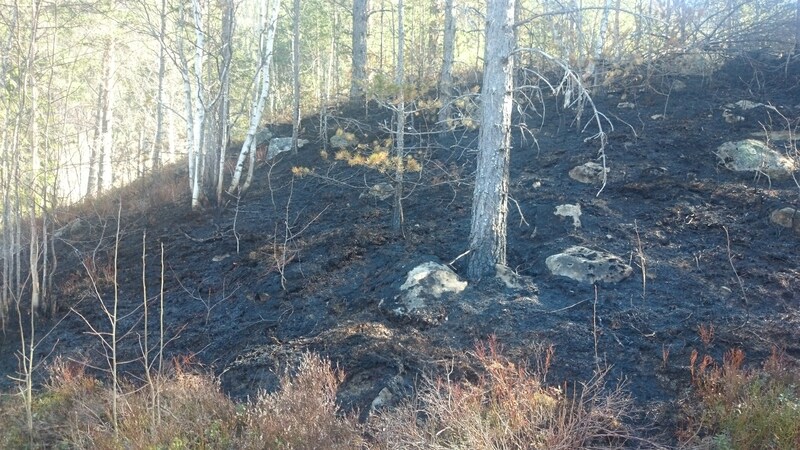 It’s fairly easy to contain the fire from spreading back there, spruce boughs are generally sufficient. The fire will then rage with the wind until the other end has been reached. Poor preparation of the downwind bottlenecks can cause disaster at this point. Be methodical and thorough. Any trees you want to save you should limb below man hight. 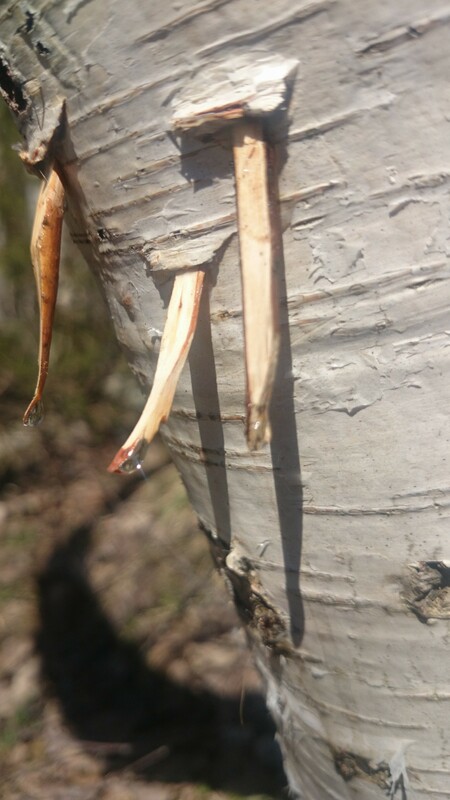 Sensitive trees such as birch should also have most of the fuel laying around the stem removed to decrease the intensity of the fire around the stem. 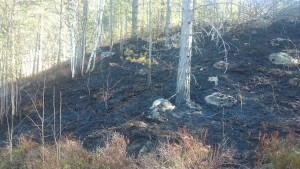 I burn mostly in the evenings, when the sun has dried up the ground as much as possible. The moist and coolness of the coming night also reduces the risk of flare-ups. If the ground is very dry or your bottlenecks are ill prepared, burn only when there is no wind. If the ground is wetter than ideal, burn in as high winds as possible to get the temperature going. Too early burns will have little effect except removing some litter on the ground and promote growth. Too late burns will burn the soil itself and are very dangerous. For most purposes the ideal burn kills all saplings and small bushes. Heather is best burnt at a 10-15 years interval in my area. When a lot of it is dying and the ground is becoming mossy, it’s time to burn again. If you burn every year you will get a grass and flower meadow. Grass and herbs like angelica are very positively affected by burning. Small conifer trees and bushes are likely to be killed. Saplings from deciduous trees can survive if the fire isn’t intense enough. Above: Brush burnt several years ago. It has regenerated nicely. Above: This patch is burnt every year to eventually become a meadow. Above: Burning heather and brush. See the snow forming a barrier. 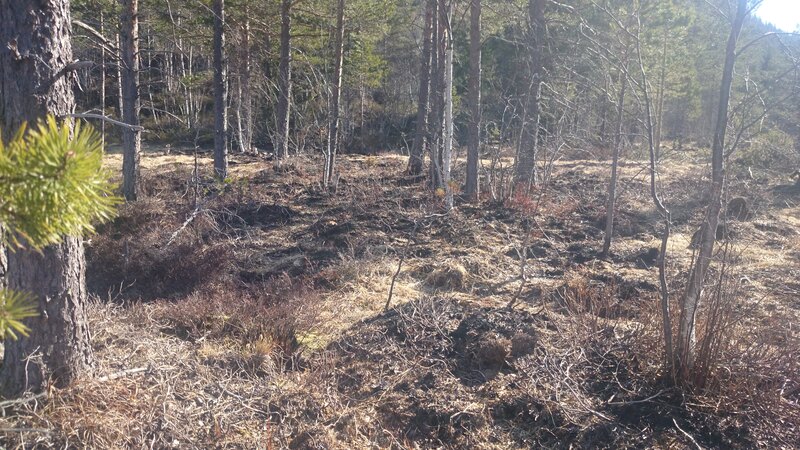 Below: Part of the same burnt area a month later.